Coffee Supremacy reader send us his Kirkland Colombian Supremo review and we want to share with you his story about this whole bean coffee. To be perfectly honest with you, I started consuming coffee (in like, “really large amounts”) couple years ago and it was just recently when I tried Kirkland Colombian Supremo coffee for the first time. Thing is, coffee has really affected our daily lives, especially in these modern times when most of us work from home or in some office. Another good thing is, you are not bound to consume just the products of your local supplier because now you have means to order something from another part of the world (thank you internet!). Coffee has become a vital part of our society, it has become a sort of “daily ritual” to drink a cup of this fantastic beverage with our friends, family or even alone while watching TV, reading a book or just surfing the internet. I drink two to three cups a day, so you can guess how much I care about the quality of my coffee. Because I always like to try new things, I was often buying a different brand, just to give it a shot. Some brands were good but too expensive for me on the long run. On the other hand, some were quite affordable, but these sometimes left a really bad taste in my mouth. (our comment: he certainly did not read our article about cheap and excellent whole bean coffee ) Still, I was yet to find a perfect match for me. As I mentioned before I am a real coffee lover. And I really don’t like to drink it alone. Because of that, most of my friends visit me on a daily basis and then we spend hours sitting on the balcony and talking about everything with a warm cup of coffee in our hands. One day a friend of mine came to my house bearing a present. Well, it was more a sort of a tribute because he rarely leaves my home and drinks my coffee, but hey, I chose him. Since he is also a coffee enthusiast like me, he wanted to try something new and share it with his friends. My friend ordered a package of Kirkland Colombian Supremo Whole Bean Coffee via Amazon and then brought it to me. I must say that, because I know my friend who is really easy to excite, I wasn’t really sure that Kirkland Colombian Supremo coffee was that good as he said. I have let him to grind the beans and to heat the water. While he was doing all that, I decided to smell the package that he brought (there were still beans inside). Honestly speaking, the smell was actually quite good. It was strong and fresh. I decided to wait for my friend to prepare and serve the coffee. I was sitting on the balcony thinking how beautiful it is to have the means to try something new from entirely different part of the world. It never occurred to me to purchase a package of coffee online because I had a mall for that. Finally, the cup of Kirkland Colombian Supremo was brought before me. I must say that I fell in love with this coffee at the first sip. It had a really strong taste, yet it didn’t overcome my senses. Most of the other coffees had a similar effect on me, but after a second cup, I couldn’t take it anymore. This one was different, it was somewhat “balanced”. Its beautiful aroma can be felt from a mile away. Of course, there are similar coffees like this one. Thing is, when my friend told me the price of it, I couldn’t believe it. 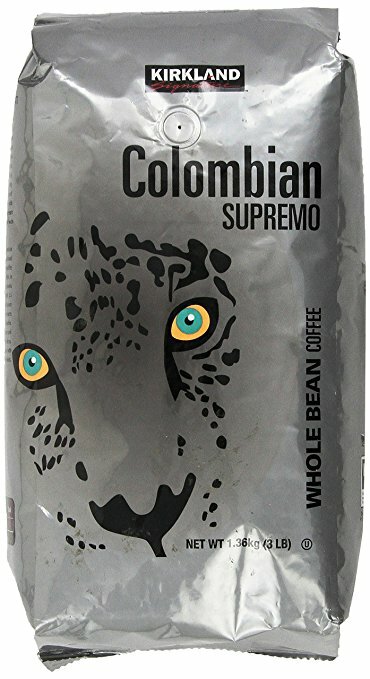 You can find Kirkland Colombian Supremo whole bean coffee on Amazon. Some other brands that have left a similar impression on me cost much more. After I finished my drink, I inspected the package. It turns out that Kirkland Colombian Supremo coffee beans are a little oily but more on the dry side. My friend told me that he keeps the beans refrigerated. “It will keep them fresh for a long time,” he says. Honestly speaking, I heeded his advice. Why have I picked Kirkland Colombian Supremo coffee? Like I mentioned before, it really has a good taste. This is a medium-bodied coffee that has a good flavor. Most importantly, the price is great. True, there are somewhat better coffee on the market than Kirkland Colombian Supremo whole bean coffee, but these costs at least twice the price. When it comes to a price like this, I can vouch that this is a most likely the best coffee that you can purchase for that money. Plus, it is not bad to think long term. For a decent amount of cash, you can supply yourself with “A class” coffee beans for a long time. And if you are coffee enthusiast like me, you won’t be sorry. We hope you liked this coffee review. If you want, you can share review of your favorite coffee with us. What goes good with coffee? Does coffee help with hangover headaches? What is breakfast blend coffee?